Nothing is safe from being engulfed by the lightning-speed growth of kudzu (Pueraria montana var. lobata; formerly known as Pueraria lobata). Buildings, power poles and other plants are at the mercy of this robust vine's advances. Killing kudzu is not a quick fix and it may take up to 10 years to eradicate it. Kudzu vines can grow 1 foot each day during the growing season. 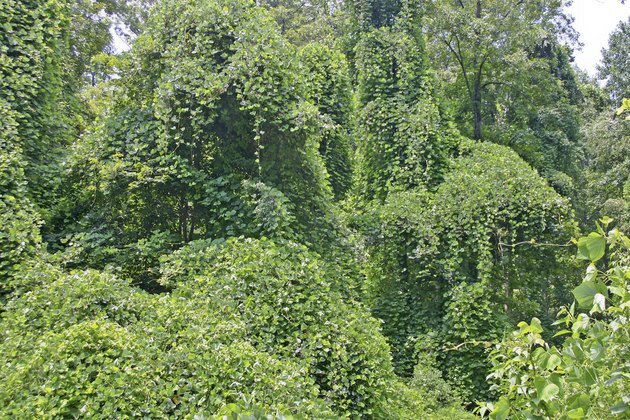 Every part of the kudzu plant is larger than life -- leaves, older stems, tubers and purplish flower clusters. Vines may grow to 100 feet vertically and 50 feet laterally. Although first-year stems typically grow only 1/2 inch in diameter, older stems may reach diameters of 4 inches. The tuberous taproot that anchors mature plants may grow to 12 feet deep and weigh up to 300 pounds. The panicle-shaped flower clusters, which give way to leguminous seed pods, may reach 10 inches long. But these seeds are not the propagating threat of kudzu. Thirty vines may sprout from one root crown, and as the vines scramble along the ground, they can form roots wherever they make contact with the soil to form new plants. Diligence in eradicating the tuberous roots is the key to killing kudzu. If you spray kudzu's broad leaves with a ready-to-spray herbicide that contains 2 percent glyphosate, the chemical will move throughout the plant, killing cell tissue as it goes. Another effective chemical is triclopyr, which you mix typically at the rate of 4 ounces in 1 gallon of water. In summer, when the plants are in full bloom, spray the leaves until they're wet, but not to the point of runoff. The leaves should be coated with the chemical so it looks like they've received a light rainfall. Repeat the application up to a month later. Because these chemicals are non-selective herbicides, they kill not only kudzu but other plants, too, so be careful not to get the chemical on nearby plants. Wear gloves and protective clothing when spraying the plants. In areas where kudzu vines have grown up tree trunks or invaded a flower garden, you can't spray the foliage without damaging other plants. If you cut the stems and remove the vines and foliage, the stumps will re-sprout unless you use an herbicide. Cut kudzu stems as close to the ground as possible, removing sawdust and dirt from the severed surfaces. Using a sponge or paintbrush, apply glyphosate or triclopyr at full-strength to the stump. You may have to repeat this treatment over the next few growing seasons if the stumps continue sprouting. Although kudzu grows as a perennial in U.S. Department of Agriculture plant hardiness zones 5 through 10, the plants are killed to the ground during winter in zones 5 and 6. New vines, however, re-sprout in spring from the roots that lie dormant during the winter but remain very much alive underground. Mowing, animal grazing, disking and burning the plants are only temporary methods of killing the top growth. The formidable tubers continue to regenerate new growth unless you use a chemical herbicide. Follow stems to where they sprout from the ground and dig down until you find the root crown -- the area from which the roots radiate. Cut into the crown and apply a solution of 50 percent glyphosate or 50 percent triclopyr and 50 percent water. If you're able to dig deeper and find any tubers, cut the stems where they attach to the tubers, and paint the cut surfaces of the tubers with triclopyr.